The »Supersportwagen [Super Sports Cars] « exhibition makes the newly launched gull-winged SMS AMG super sports car join the ranks of the more than a hundred year-old legendary sports car tradition of Mercedes-Benz. Eight vehicles are presented on a platform where they are lined up chronologically to a starting position. The exhibition’s visual effect is based on the sequence of platform modules and the parallel arranged dynamically shaped wings. All relevant communication media are integrated into a slanting. As part of the exhibition, in a lounge, the visitor can obtain additional information about the legendary sports cars on iPads. Also, three Grand Tourismo 5 stations for test drives are available. 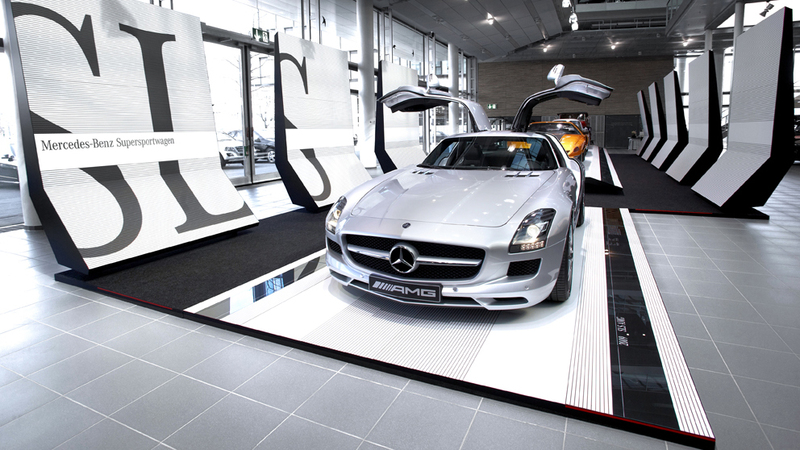 Next to the exhibition in the Mercedes-Benz Museum, several four-vehicles-sets are shown in the Mercedes-Benz Centers. Besides the exhibition design, jangled nerves was also a major component in the production of the multi-channel communication by creating a web special as well as an iPhone/iPad App.